The Chief of Safety for the operator reported that the student pilot was on a solo flight in a glider and on the return leg to the airport when he noticed that he “seemed to be sinking quickly.” While talking with his instructor over the radio and scanning for an open field, he decided to land on a street in a nearby neighborhood. While on approach, the glider struck tree tops and then a power line. Subsequently, the glider rolled to the right and the right wing struck the ground. The glider came to rest on the right side of the fuselage and the student pilot exited the glider. The Chief of Safety for the operator reported that, the student pilot was on a solo flight, and on the return leg to the airport, the student pilot noticed that he "seemed to be sinking quickly." While talking with his instructor over the radio and scanning for an open field, he decided to land on a street in a nearby neighborhood. While on approach, the glider struck tree tops and then a powerline. Subsequently, the glider rolled to the right and the right wing struck the ground. The glider came to rest on the right side of the fuselage and the student pilot exited the glider. The automated weather observation system about 8 nautical miles from the accident site reported, about the time of the accident, wind calm, temperature 91°F, dew point 75°F, and barometric 30.04" Hg. 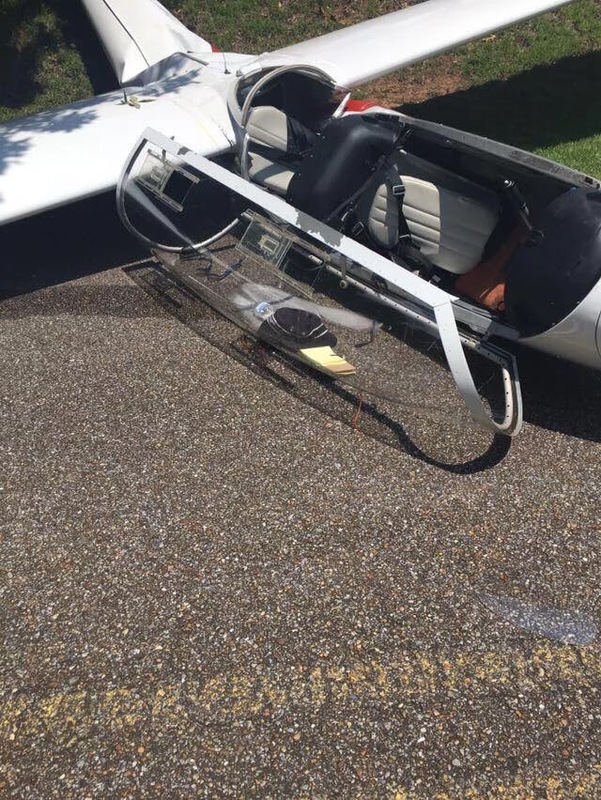 DEATSVILLE, AL (WSFA) - A 16-year-old pilot landed in a residential area while operating a glider Friday, according to the Millbrook Police Department. The boy, whose name has not been released, was not seriously injured in the incident, according to Chief P.K. Johnson. There were no other reported injuries, and no other property besides the glider was damaged. "This young man was very fortunate, as were the residents in the area," Johnson said. "I believe had he not quickly assessed his situation and realized that he was not going to make it back to Wetumpka Airport, we very well could be discussing a tragedy." The force landing happened between the roadway and a residence in the 300 block of Fraley Lane in Deatsville. When the boy lost altitude, he made the decision to attempt a crash landing. The boy was reportedly flying towards the Wetumpka Airport when he realized he wasn't going to make it. According to a statement he gave police, the boy initially looked for a vacant field to make a safe landing. After seeing nowhere else to land, the boy told authorities he was forced to use trees to slow his decent into a residential area. During that descent, the glider struck a power line, briefly knocking out power in the area. "I'm very impressed that the young man was concerned about causing harm to others, especially when you consider that he was in danger of being injured or worse," Johnson said. "That speaks highly of both his training as a pilot and his character." Johnson said the power line was knocked down onto the road, temporarily blocking it. That road has since been cleared, according to police. The Millbrook Police and Fire Departments responded just after noon today to Fraley Road after a glider pilot struck some power lines and crashed. The pilot walked away from the incident without serious injury, but was very lucky according to Fire Chief Larry Brown. Fraley Lane is located off Country Place in an area of Gunnels Road. "We did not have to transport him and he was very lucky," Chief Brown said. Seems strange that the Civil Air Patrol has a glider they let this teen fly. Great opportunity for young flyers but at taxpayers expense, it seems to be an abuse of tax payers dollars. It is one of the three missions of the Civil Air Patrol (CAP) to enhance Aerospace Education. A big part of this mission is achieved by introducing young people in the Cadet Program to aviation via a hands-on flying experience. This has been mandated for CAP since its charter by the US Congress in 1941. If you disagree with this use of tax dollars then you should take it with your Congressional Representative of choice to change the law as written. You CAP guys are a joke. They should publish as NOTAM to warn us when you fly. I have had four experiences with the CAP. 1. Pulling up to a neighbors hangar with the hangar door open and doing a run up. Only after asking ground control to help us did the cap pilot move to the run up area. 2. While landing, a cap plane stopped on the runway without permission from ATC. This caused a problem with incoming traffic on a busy day. The tower asked this pilot to report to them. 3. While flying my plane at 1500' agl, a cap 182 nearly collided with my plan while buzzing a house in a small town. This I reported. 4. While holding for takeoff clearance, the tower called the prior departed plane, a cap 182, back to the airport as the pilots credentials were expired. Never heard if it was the medical, or biennial flight review. A cap supervisor asked the tower the broadcast this to all. It seems like allot of amateur mistakes for an organization we pay dearly for. My vote would be to quit funding it and sell off the assets. If you want more information on this great government program run by a bunch of professionals, google Civil Air Patrol on this site. You will see an unusualy high incident rate. It is really hard to believe that these action are the result of their efforts to promote the organization and its mission. It's as embarrassing as the recent accidents by our Navy! It's as embarrassing as the recent accidents by our Navy! The sailors aboard every USS Ship gives their trust, and lives, over to the Officers of the Deck, members of the watch, their Commanding Officer and Executive Officer to keep them safe. The sailors aboard the USS John S Mc Cain were let down, and the lives of ten sailors may have been lost. An investigation will occur, and it appears as if the sailors trust was violated not only by the specific members of this crew, but by the entire chain-of-command all the way to the laps of the voters. This investigation should not be allowed to be white-washed and swept under the rug per the Wash D.C. crony fashion. A comprehensive investigation should occur, this may point to a systemic issue that needs correction now. May those responsible for the root of the systemic problems which may have caused these deaths be identified, and their poor judgement scorned. May these young sailors, whose trust was violated, rest in eternal peace. May God comfort the families of these sailors. As someone who had an interest in flying for the CAP, I have since changed my mind after seeing the many CAP plane mishaps and crashes on Katheryn's Report and Aux Beacon. The real stats would scare most pilots away. The CAP seems to be accountable to no one while Congress and the military avoid any oversight. While the CAP may have served a need in the past, today it serves no one, except it is more government waste and our tax dollars spent on maverick aviators. This story below was an eye opener and it is what convinced me to move on. For anyone considering the CAP, tread carefully since safety is not a top priority at any level. You don't want to end up as another fatal statistic on Katheryn's Report. Nasty nasty nasty anonymous commentators. Jim B, the truth hurts. If you inquire regarding who is accountable, you become a CAP hater, and trouble maker. Sounds like politics as usual for our country.